We recently hit with the BBCOR and Big Barrel versions of the new 2017 Mizuno Covert. Our hitting experience was mostly in cage, although we took it to the field to see ball flight as well. We also exchanged a number of emails with Mizuno to dial in our understanding of the bat and how it upgraded from the 2016 Nighthawk. As well, a number of trusted online sources were referenced for details and other player experience on the Covert. All of this information is compiled below in our 2017 Mizuno Covert Review. Best price we found on the Covert was on Amazon (here). See our 2016 Mizuno Nighthawk Review here. The 2017 Mizuno Covert is a new name in the 2017 Mizuno line of baseball bats. It should be considered the next generation 2016 Mizuno Nighthawk. The name change, as far as we have gathered, is to clear up confusion between the Mizuno Nighthawk fastpitch line, made up of two piece composite bats, and the Nighthawk baseball line, made of hybrid bats. 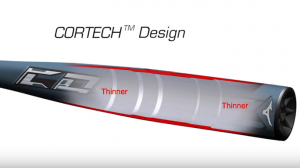 The Covert model should be the hybrid baseball bat name going forward. Amazingly, Mizuno has only been in the metal and composite bat space for 3 years. Mizuno is dead serious about making top shelf performance bats in the BBCOR and Big Barrel space. Seriously, watch out. Although there are some notable differences, the idea is the same between the 2016 Nighthawk and the 2017 Covert. Both bats are two piece hybrid bats. This means they have a composite handle and an aluminum alloy barrel. They are welded together around the midpoint of the bat. 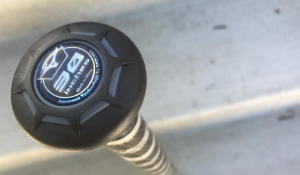 By way of changes, Mizuno updated the aluminum alloy in the bat. They claim the alloy is stronger and, therefore, the walls can be thinner. Thinner walls would allow the bat a larger sweet spot by exaggerating the tapered barrel design without losing durability. Mizuno claims the sweet spot (where max pop is achieved) is 22% longer than the Nighthawk. There is no practical way to confirm if these advancements have been achieved, we simply report on what they claim. The thinner walls also decrease the effective swing weight. Although it should still be considered a mid balanced bat, the 2017 Covert will swing lighter than the 2016 Nighthawk. Although a legit bat, that doesn’t mean it is for everyone. We’d stay away from the bat if we fit into any of the categories below. The two piece hybrid bat with a mid to light swing has a few competitors. 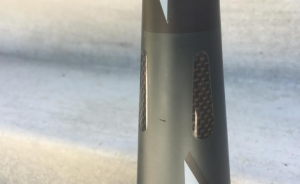 None have the same tapered inner barrel the Mizuno Covert uses, but a few get some good barrel size and performance reports. Two bats in particular come to mind. 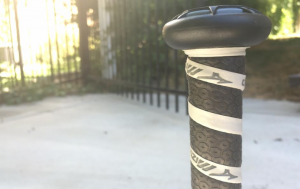 The 2016 Louisville Slugger 716 (Our review) and the 2017 DeMarini Voodoo Balanced (our review). Both have similar price points, swing weights and performance metrics as the 2017 Mizuno Covert. Those looking for similar bats may want to check them out as well. We reviewed a number of sources, including our extensive bat resources, in writing this review. Below are some of the ones we found most helpful.